One of the most important aspects of your LinkedIn profile is the list of positions you’ve held over the years, including your current job. This list is especially important if you’re using LinkedIn to find a new or different career or to reconnect with past colleagues. Hiring managers want to see your complete history to know what skills you offer, and past colleagues can’t find you as easily through LinkedIn if the job they knew you from isn’t on your profile. Therefore, it’s critical to make sure you have all the positions posted on your profile with the correct information, as long as that fits with the image you want to portray to the professional world. If your company is not listed in LinkedIn’s directory, you need to fill in the industry and website for the company when you’re adding your position to your LinkedIn profile. Use your resume when completing this section, because most resumes include all or most of the information required. 1Go to LinkedIn and log in. Hover your mouse over the Profile link in the top navigation bar, then click Edit Profile from the drop-down list that appears. This step takes you to your profile page. Scroll down your profile until you see the Experience header. 2Click the Add a Position link to the right of the Experience header. You see an expanded Experience section with all the necessary text boxes. 3In the text boxes provided, enter the information about your position, including company, title, location, time period, and job description. When you type in your company name, LinkedIn checks that name against its Company pages of thousands of companies from its records, and you see suggested company names while you type. 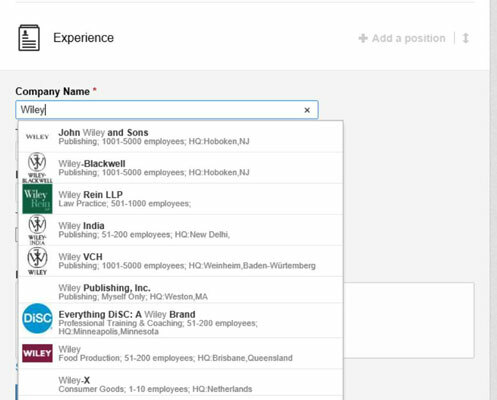 If you see your company name in that list, click the name, and LinkedIn automatically fills in all the company detail information for you. 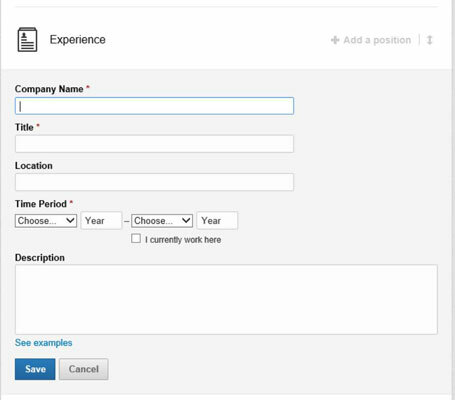 After entering the company name, enter your title, job location, the time period when you worked there, and a description of your position. This adds the newly entered position into your profile, and you’re taken back to your profile page. 5Repeat Steps 2–4 for any additional position you want to enter. 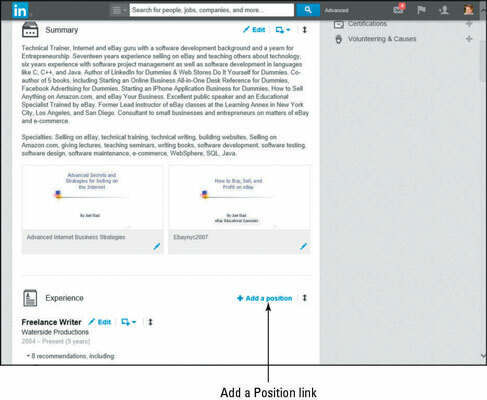 To edit a position you already listed, click the Edit link next to that record in the Experience section instead of clicking the Add a Position link. The Experience section isn’t just for paid full-time employment. 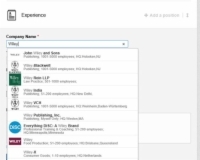 You can add position information for any contract work, nonprofit volunteer assignments, board of director membership, or other valid work experience that added to your skill set. If you’ve written a book, maintain a blog, or have a regular magazine column, you might want to list that as a separate position. 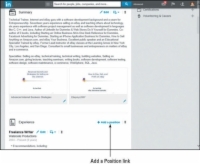 If you have most of the information that LinkedIn asks for a given position but you’re missing a few details in the description, go ahead and add what you have. 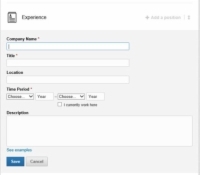 (You must provide a job title, company, and time period to save the position in your profile.) You can fill in any missing information later. In addition, if you make your profile public, make sure any position information you enter is something you don’t mind the whole world seeing on your profile.